I’ve mentioned before that I’ve been having issues with the brakes on my Genesis Day01 Alfine bike. I’m not the only one, I was first made aware of a potential issue by another owner. Fortunately for him, his bike was fixed by his local bike shop but unfortunately for the rest of us he was unaware of how the issue was fixed. The issue seems to be caused by the non-standard disc rotor. The brakes are Tektro Lyra’s but the rotors are Shimano CL rotors. This means the brake pads don’t sit perfectly over the disc when you put them on. Unfortunately this is hard to see and is noticeable after some use and the dirt on the disc brake shows where the pad runs. The front brake is an interesting one. As with any steel fork and a disc brake, there is some flex when you apply the brake. But what i experienced was far from some flex. The brake pad overlapped the edge of the disc by quite a bit. At least 1cm of the pad was running on the rotor arms. This meant that there was a constant shudder when you used the brake, due to the pad gripping on the rotor arm and the brake experiencing more friction at that point. This judder traveled through the forks and into the handle bars, it was disconcerting but did not affect performance in a manner which was bad. The rear brake was the one with a problem. For some unknown reason, I would pull on the brake and feel it bite, I would start to decelerate. Apply a little bit more pressure and all of a sudden the brake would just let go and you would stop decelerating. I couldn’t get my head around it, I looked into how mechanical brakes worked, did lots of reading in books and online but could not figure out why the brake would suddenly let go. Back when I first found out these issues, I contacted Genesis to try to get some help with this issue. Unfortunately they where not much help and said that it was natural for steel forks to behave in this way. It came to the point where I could take it no more, and I took my bike back to Evans and got them to look at it for me. They saw the issue straight away and added some spacers and longer bolts onto the brake attachment thingy majig (can you tell that i don’t know what it is called?). This meant that the pads no longer rubbed on the rotor arms and braking was smooth and powerful. The problem with this is finding the issue in the first place. It’s hard to see this issue when you are putting the bike together in a work shop. And testing it is impossible without taking the bike out on the road. This is because pulling the brake whilst the wheel spinning in a stand will nearly always stop it but what we want to test is how it acts when there is more weight behind the bike. I did notice the issue with the front fork when I test rode the bike but as with all disc braked bikes, beading in is always the excuse. Fortunately for me, the braking issues are resolved and the brakes are sharper than ever. Hopefully this is read by other users of the day01 and they can easily get it resolved. Back in mid 2010 I remember seeing some photos from a bicycle show where Genesis was showing off their 2011 range of bikes. The Day01 Alfine caught up eye straight away. 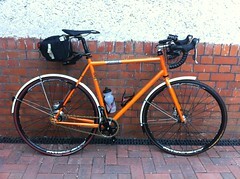 Hub gear, disc brakes and bright orange, what more could you want for a commuter bicycle? I was in the market for a new bike, i had been commuting on a carbon racer for some time and I didn’t want that to continue through another winter. One day in September I went into my local bike shop to buy a new tyre for one that got shredded only minutes before. Further into the shop was the Genesis Day01 standing out from everything else with its orange paint. Unfortunately the frame was too small for me, but I ordered in a bigger frame in for a test ride. A week later and I was back at the shop and took the bike for a few spins, it had a great ride and felt very different to my racer. Definitely something I could use for commuting. It was an easy choice and I parted with my cash for a great looking bike. I added some mudguards and Kevlar lined tyres for a bit more but definitely something needed for high mileage commuting through London and it’s suburbs. First day of commuting on the Day01 and everything was going well. Until I was about 2 miles away from my house and I got a nasty p*nct*r* and the rear went flat. As I was so close to home I decided to walk it back and change it after I had eaten my supper and wasn’t in a rush. Little did I know how hard it was going to be. At first I had issues getting the rear wheel off. I had undone the wheel nuts but due to chain tugs and the tension on the chain I couldn’t get the chain off either of the chain rings. A few small turns of the chain tugs and I was easily able to get the wheel off. A quick change of the inner tube and a check of the tyre for anything left over. Everything was fine. The hard part was putting the wheel back on. Getting the chain tension right and the wheel aligned in a position with the disc brakes took a lot of time. But when I had finally done it there was only one thing left to do, put the gear change cable back in. I put it in perfectly but when I went to change the gears, the cable was put under too much pressure and it snapped. BALLS!! Next day I popped into the bike shop and asked if they could sort it out for me, half hour later it was ready to be picked up and I continued my journey to work. All was going well with the bike. A fellow owner of a Genesis Day01 noted on a forum that he had issues with the brakes. I contacted Genesis about this and explained that I had noticed an issue with the front brake which made the forks shudder under the slightest load. I understand that with a steel fork and a disc brake mounted where it is, there is loads put onto that fork and it can stress and flex but I would not expect it to do so at the level i was applying. I’m actively looking into this issue and hoping to resolve it soon, luckily it doesn’t affect heavy braking. The date is November 02 2010 and i’m taking a usual route to work where by I cycle through Croydon town centre. The conditions are damp and there are leaves on the floor. I have cycled this many times with no issues but today was going to be different. As I went to cross the metal guttering, my front wheel passed over a wet leaf at the same time and I lost the front wheel. The bike just went down and I slid a few meters. Certainly not comfortable but I was able to get back onto the bike and continue my journey with ease. Back on December 16th 2010 I was commuting home through snow, this was going to be my last commute home for a few weeks as I had the rest of the time booked off for the christmas break. But what I didn’t realise is that it was going to be my last ride for a while due to something else. I don’t want to say too much as the case is still on going, but it ended up with me on the bonnet of the car. It took my LBS a good few weeks to get the parts and fix my bike, they had issues sourcing a hub and a rim. It seems the standard Alex rim used on the Genesis is hard to get hold of. I got my bike back last week and I did some good mileage on it last week. But come Friday I was having some issues with my rear brake, an issue which had cropped up before and something I wanted to sort out. You can feel tension in the rear brake when you pull the lever, but if you keep pulling you will feel the tension go and the bike stops decelerating. This is a real issue when you are trying to turn right, it makes it impossible to indicate. I thought I had found a fix for this, which was to change the position of the fixed pad, by moving it closer to the disc I found it solved the issue, but only for a short amount of time. Anyway, I took it to Evans in Victoria, London and their mechanic had a look at it, he thought he had solved the issue but he hadn’t, he also found that a spoke on the rear wheel was broken. Which would explain why the rear end felt a bit funny through some corners. The bike is now booked in for a service at Evans west end, London and hopefully all these issues will be resolved and I don’t have any more bad luck with it!